The Bank of England's Prudential Regulation Authority (PRA) has moved the goalposts again in respect of how much capital banks need to hold to cover the risk of losses on loans and investments. In the past week, it has told the big banks that it wants them to have equity equivalent to 3% of their gross loans and investments on a so-called stressed basis, or taking account of potential future losses. The introduction of this tough new leverage ratio, announced this morning, may sound boringly technical but it matters - because it means that two big institutions, Nationwide and Barclays have to raise quite a lot more capital than they thought. In the case of Barclays, and on a pro forma basis, the capital gap would be between £5bn and £7bn. 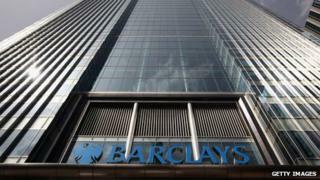 But that does not mean Barclays would have to sell new shares to that value. It can achieve the effect of meeting the new target by shrinking lending, and selling assets. And I understand the bank is hopeful that it can do what the PRA wants without too much strain. Image caption Sir Mervyn King - his last hurrah? They now feel they are being penalised for doing what the government wants. So I would expect there to be something of a spat between government and regulators about all this. There will now be a negotiation on how and when they will raise the necessary equity - but it will be easier for Barclays, with its stock market listing, than for Nationwide as a mutual building society. As it happens, the decision to push through the new leverage ratio is very much in keeping with what the outgoing governor of the Bank of England Sir Mervyn King believes is the sine qua non of strengthening banks. Some will see it as his last hurrah. So it will be fascinating to see if his Canadian successor, Mark Carney, is more or less flexible on this.